Kongskilde Industries extends the product programme of the JF complete diet mixers of the VM type with 2 new models. The new models, which have a capacity of 12 m3, the loading height is kept to 2.34m. 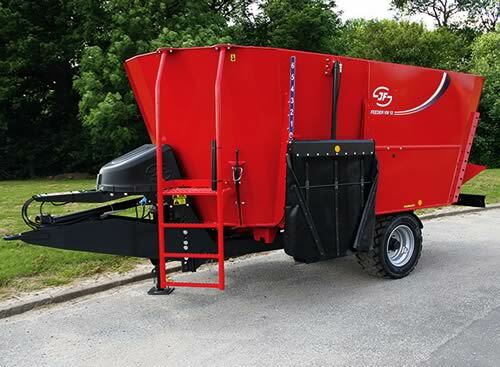 With a width of only 2.21m Kongskilde offers a very compact diet feeder, which can be loaded with small mini loaders and can manoeuvre in small buildings. With 2 mixing augers an extra "process area" is created in the middle of the feeder, where the knives meet. The new JF Feeder VM 12-2 S is therefore very suitable for shredding feed with high fibre content. For 10 years high strength steel has consequently been used in the production of the JF mixing tubs and augers. This steel type is also used in the production of the new feeders, where all auger flights have been produced from 15 mm steel and in the high strength quality S500. The tub sides have been produced in quality S650 and are 6 mm thick. Also the modular JF concept has been maintained; if the need changes due to a new barn etc. the mixer can subsequently be modified with extra unloading doors in the side or in the back end. With the wireless display in the loader cabin the feeder can be loaded from both sides or from the back, which saves loading time and minimizes the waste of feed. The new feeders have very low power consumption and can be handled by tractors from 65 hp. The augers are run at 34 rpm, which ensures a homogeneous mixture and short mixing time.